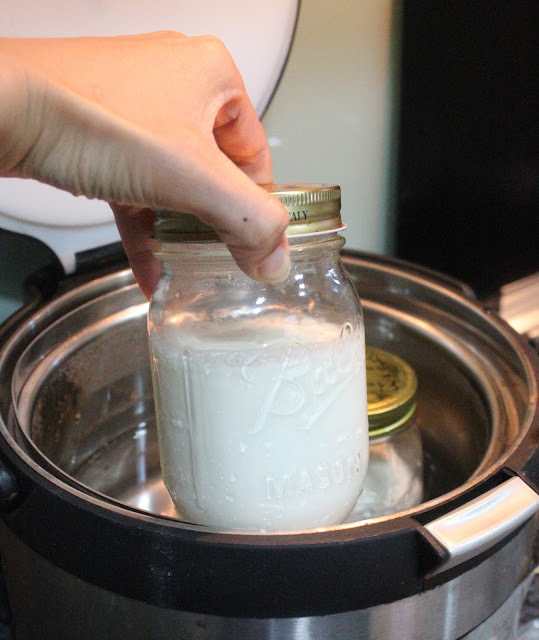 I kept seeing posts about people being successful in making their own yogurt at home. I'm super envious of course, wondering how did they do it, don't they need some special equipment or cultivate / grow some active culture? Then I saw someone posted on FB that they merely heat up the milk, add some yogurt (which already contains the active culture), let it sit at room temp for 4 hours, chill overnight and voila! I was totally wide eyed and excited! Being a huge yogurt consumer...ahem, like 1 litre in 2 days sometimes. :P This could mean money in the pocket! Plus what can be better then homemade with no preservatives? So I did some reading and also found fellow bloggers like Grace from KitchenCorner whom also did her version. And finally settled with David LeBovitz's recipe. His recipe seems easy enough (actually all the recipes are relatively easy lah) and requires reasonable waiting time. But again I made the necessary changes to suit my own needs. 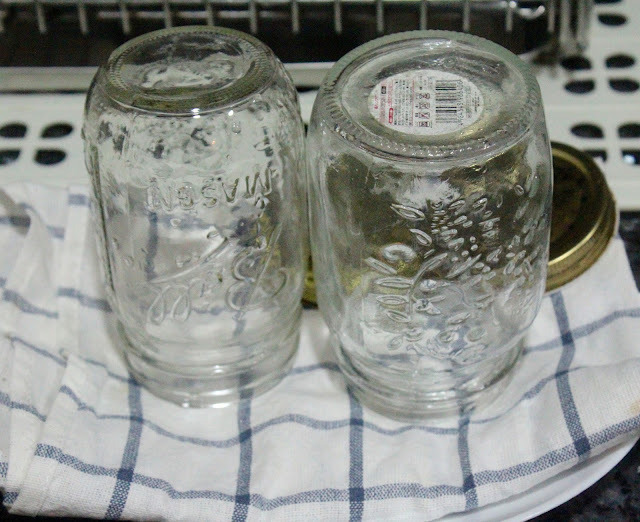 Heat up a pot of water and pour over the glass jars to sterilise. Dry and cool them on kitchen towels. 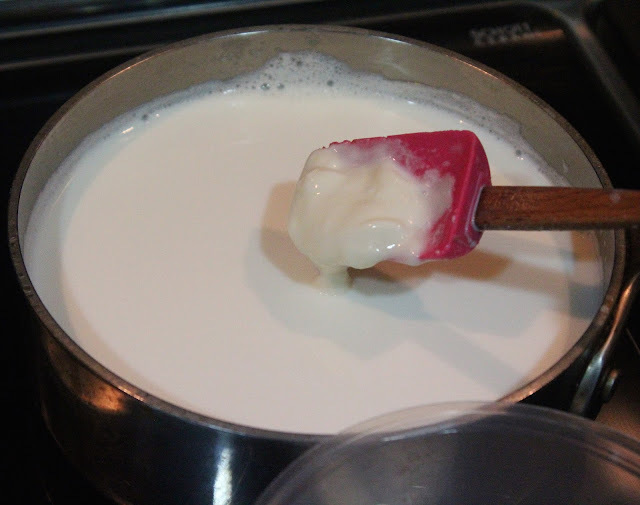 Next weigh out the milk and stick a thermometer in the pot with the milk added to it. 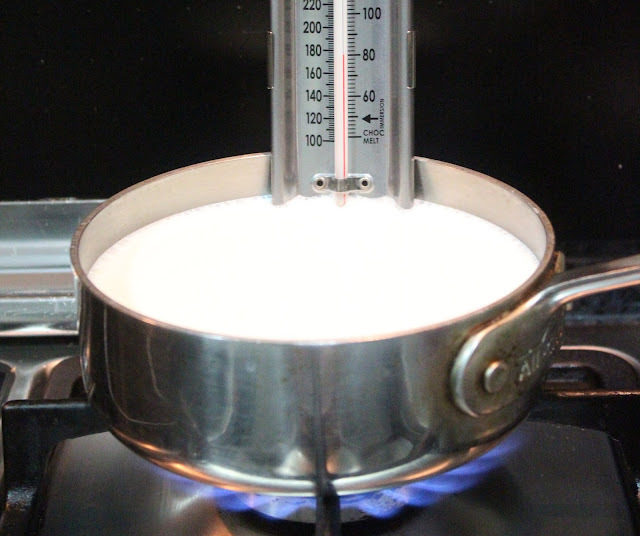 Heat the milk till it reaches 80C. Remove from the fire immediately and let cool. I placed mine in some ice water and when it reaches 45C, add in the plain yogurt and mix well till well combined. 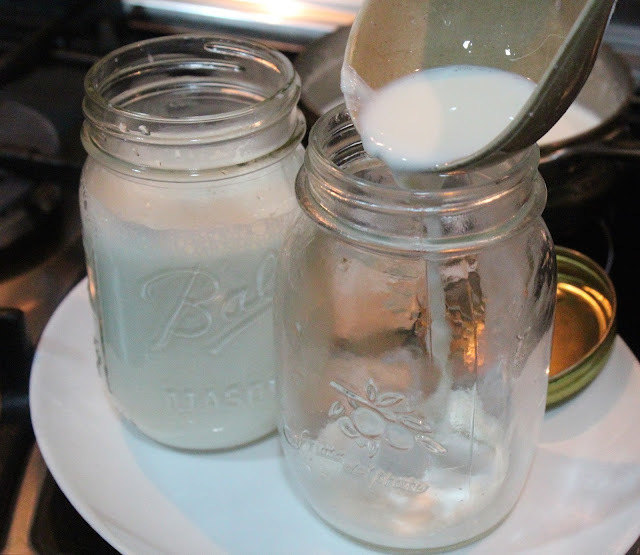 Ladle the milk into the cooled jars and cover the lids. 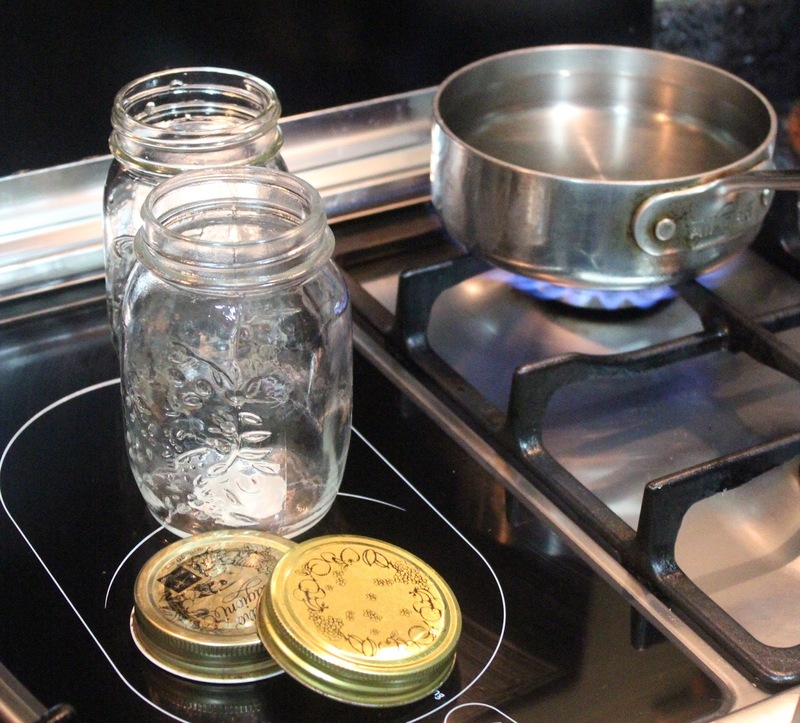 Place the filled jars in a warm place up to 8-10 hours. I actually placed mine in a thermal cooker filled with lukewarm water. After 8-10 hours, remove the yogurt from the cooker and you will notice it has "solidified". 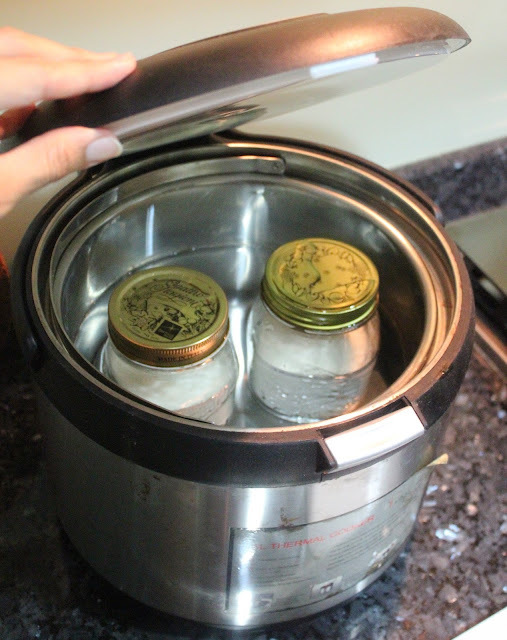 Place the jars in the fridge and let chill overnight or for 4 hours. 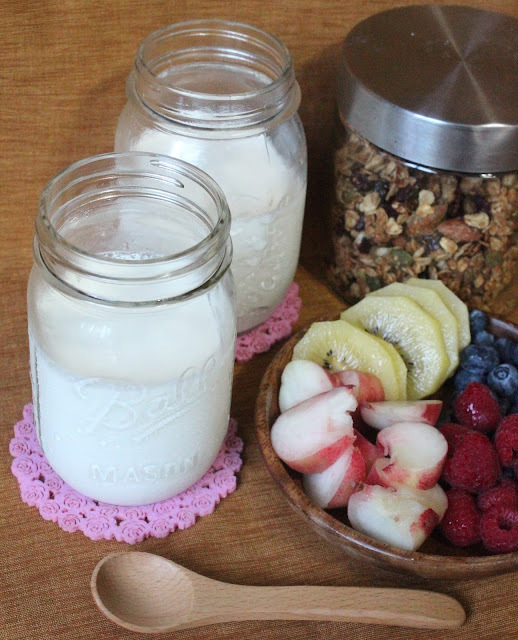 And you will have yummy healthy homemade yogurt to enjoy! I even attempted with chocolate milk! The result slightly differs from the plain milk. Definitely less tangy but more soft and almost like a thick milkshake. My kids love the chocolate version though. They can just eat it plain like that or with fruits with no additional sweetener. The formula for chocolate version is the same as the plain milk one just that it uses chocolate milk instead. I experimented it twice and it still comes out softer then the plain ones. Anyway, I am gonna try with .....ahem black sesame and peanut butter next time! #OMG Hahaha! 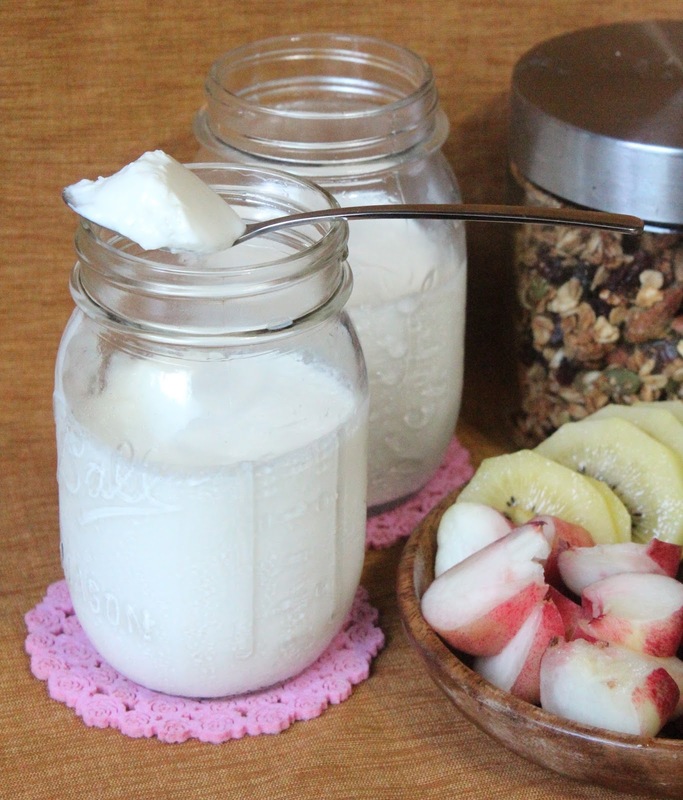 So I went on to experiment more flavours on this homemade yogurt escapade. And frankly speaking I am not done exploring yet! But for now, here are some of the new ones I have done; Milo, Thai Milk Tea and lastly Honey. - Milo powder is added right after the milk is cooked till 180C. Whisk in well. 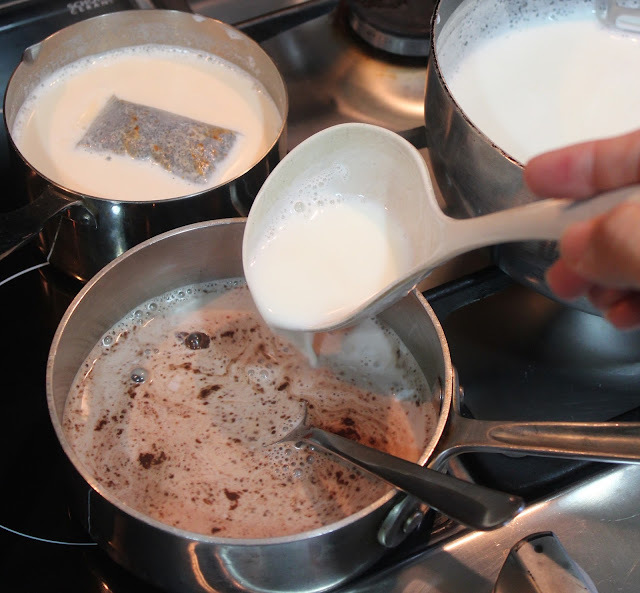 - Similarily, let the tea bags sip in the hot milk at 180C, and occasional swirl to get the mixture uniform. - Add the honey right after the milk cooked till 180C. Mix well. Currently my favourite is still Honey yogurt. 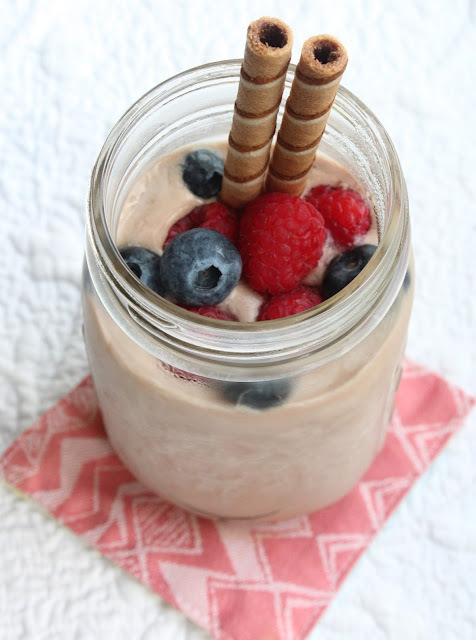 Slightly sweetened and still healthy and yummier then plain. Hope you will give this a try and let me know how yours turn out! Recently I came across this website, Rakuten.com.sg, which is a one stop shopping for any Japanese products you ever need. It carries a wide variety of of items, ranging from fashion, home and living to even food and beverage. I was particularly interested in the food section (not surprising) and was surprise to find the wide selection of food items available on their site. Since this was my first time getting items from this website, I decided to go easy and bought only 3 things. Delivery arrived swiftly in 2 days and all was in good condition. I ordered Nobashi Prawns, Chicken Yakitori and Yuzu Sesame dressing. Why Nobashi prawns? I love tempura prawns, and always wanted to try out cooking them myself! But this time I am using them for another recipe which I have been wanting to try out. 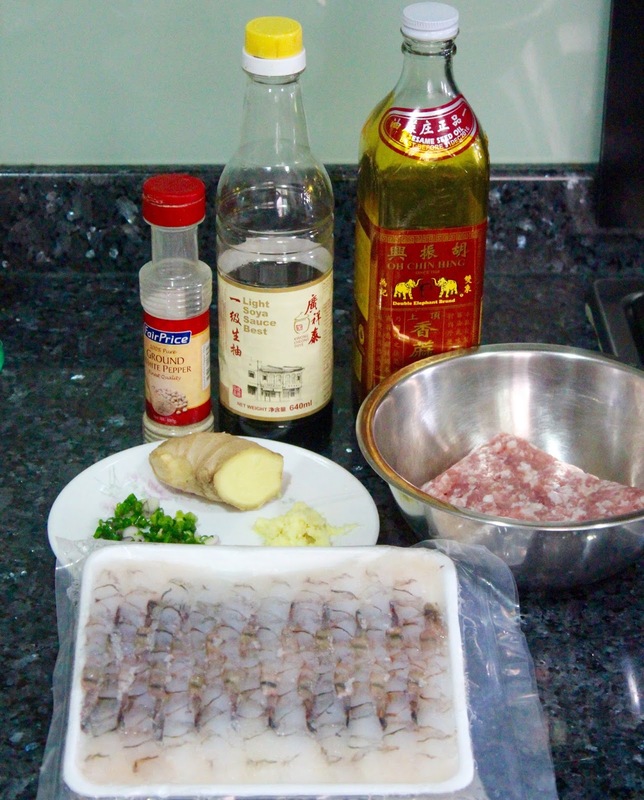 A recipe that will put these prawns' taste and texture to the "test". Lastly the yuzu dressing was a change from my usual sesame dressing that I add in my salads. Definitely a more refreshing taste compared to the latter. 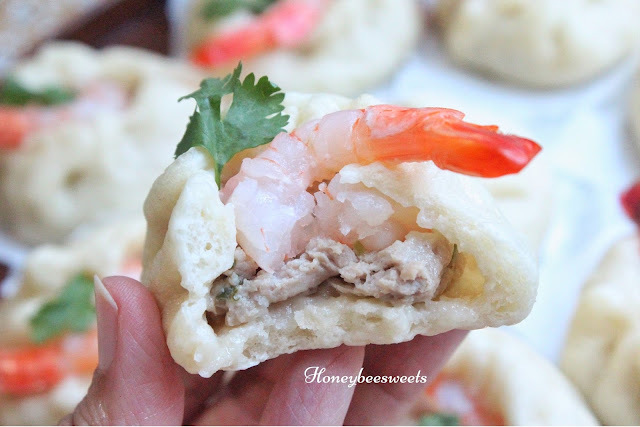 The recipe which I tried using these Nobashi prawns with was this Prawn and Minced Pork Steamed Buns (风尾虾包). As we all know, overcooked prawns can be rubbery and totally unappetising. And frankly speaking prawns are not cheap, I did not want to waste my effort and time making something that tasted horrible in the end. Thus using higher quality prawns like Nobashi, really made it all worthwhile. The end result in terms of flavor and texture, the prawn gave it a great taste. Plus there was a 20% sale! This recipe is an adaptation from 孟老师's recipe which can be found in "面食小点". Though I made a few changes to suit my own taste. :) Shall go through in a step by step method on how I make these baos. Now let's take a good look at what ingredients we need for our Prawn and Minced Pork Steamed Buns (风尾虾包). Note: I did not season the prawns because I wanted to taste the original sweetness from the seafood. In a mixing bowl, add in everything except the prawns. 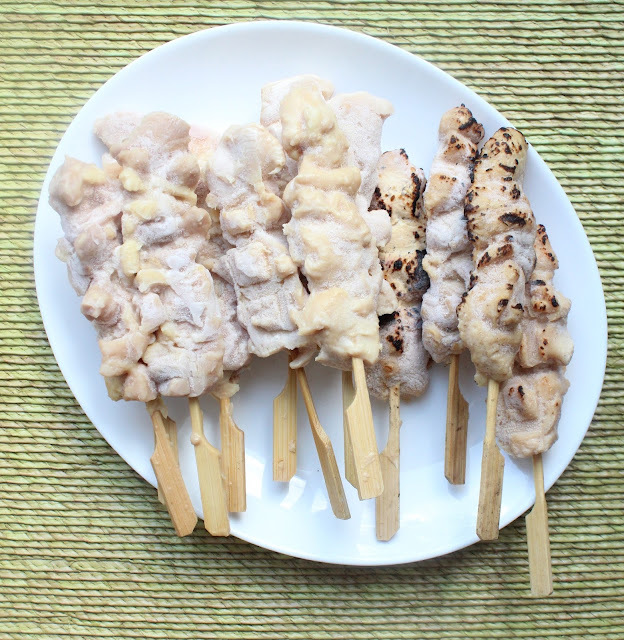 Use a pair of chopsticks and mix in a quick circular motion till the mixture is all combined and like thick paste. Cover with plastic wrap and chill in the fridge for use later. In a small mixing bowl, add in all the above ingredients and stir well till it slowly comes together to a sticky soft dough. Make sure you mixed in all the flour. Doesn't have to be smooth, so long as the dough comes together is suffix. Cover and let proof for 1.5hr. 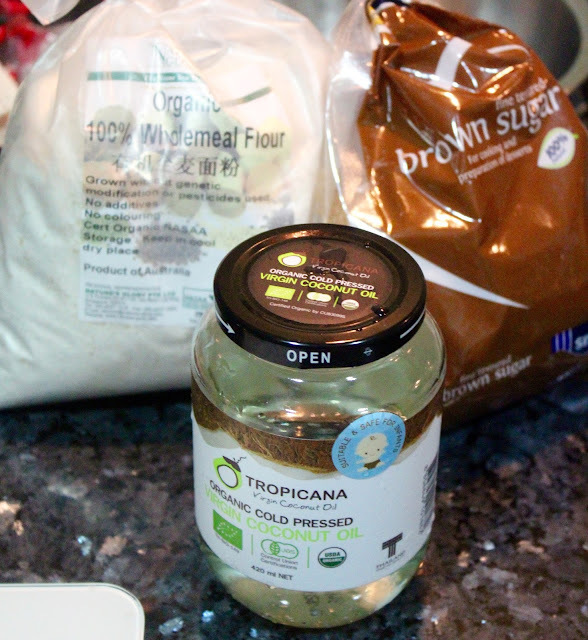 In a mixing bowl, add in the above starter dough and the above all ingredients for the main dough. Mix well using a stand mixer. 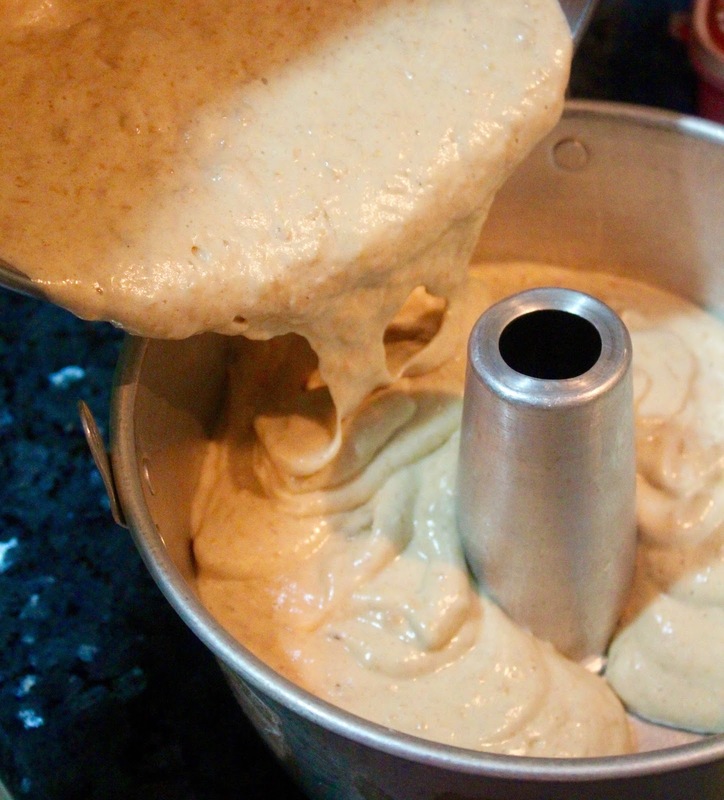 Mixture should come together to a soft pliable dough and not sticky after a few minutes of kneading. Remove from bowl and cover with damp cloth and let rest for 5 mins before shaping. After 5 minutes, divide the dough into 15 equal portions. Take one dough portion and roll out on the edges leaving slightly thicker in the middle. Repeat till all the 15 portions has been rolled out. It is okay if the edges are not that neat, it will be fold in later. Or you can opt to use more flour (which I didn't), so it will roll out neater. 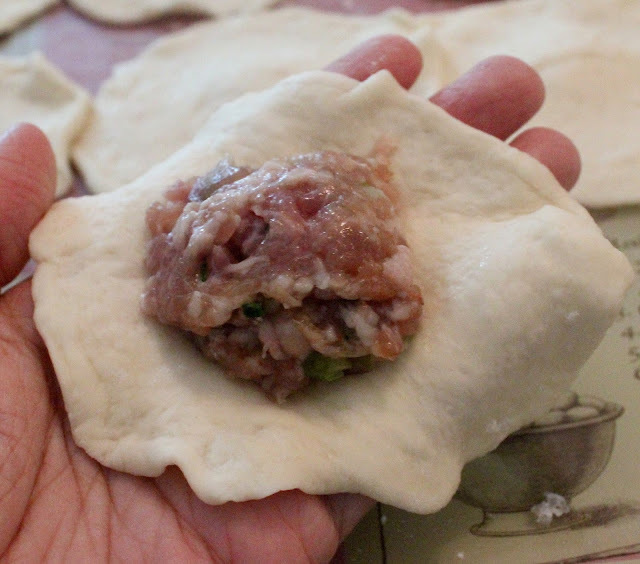 Next take one rolled out dough and scoop about 1 heaping teaspoon of the minced pork on to it. Next take a Nobashi prawn and place it over the minced pork. 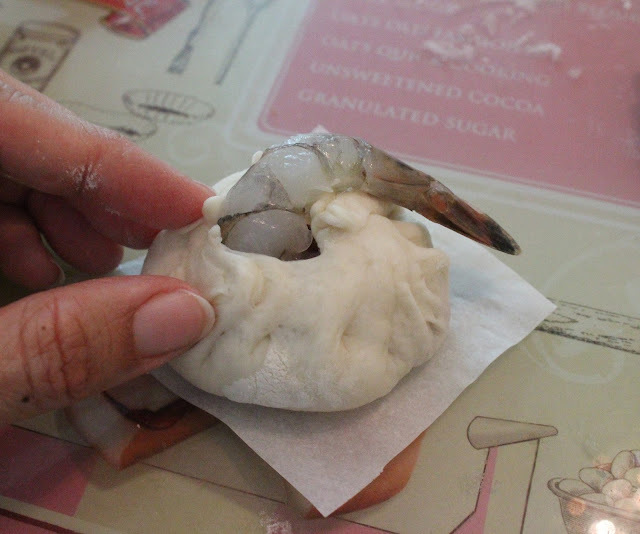 Life the prawn tail up so it won't get in the way when you are sealing up the bao. 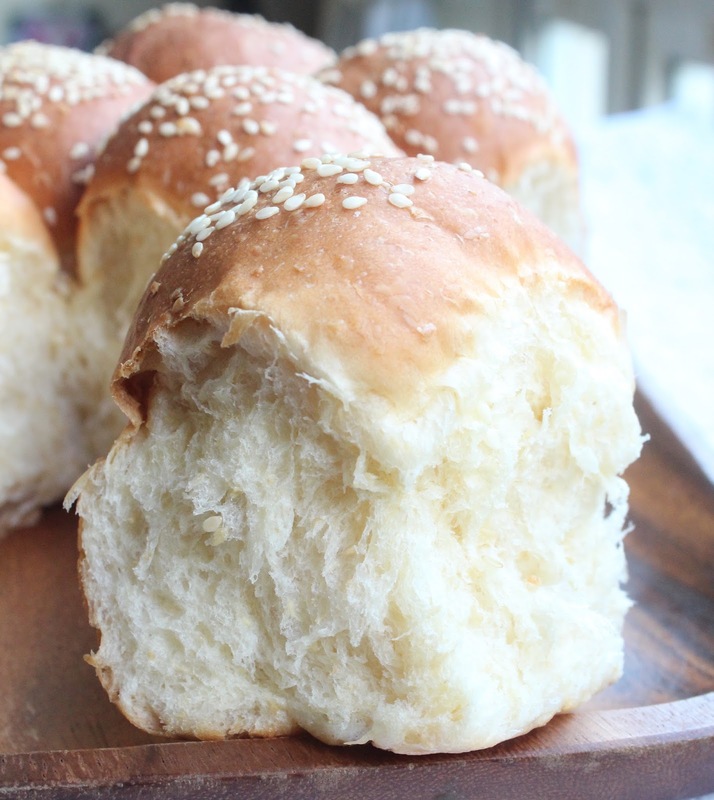 It should look like the above complete bao. 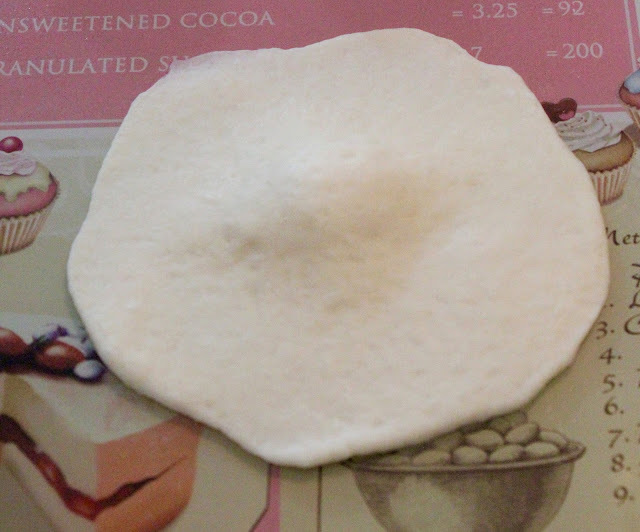 Place the bao over a small square parchment paper which will help prevent the bao from getting wet when steaming. Repeat for the rest of the portions. 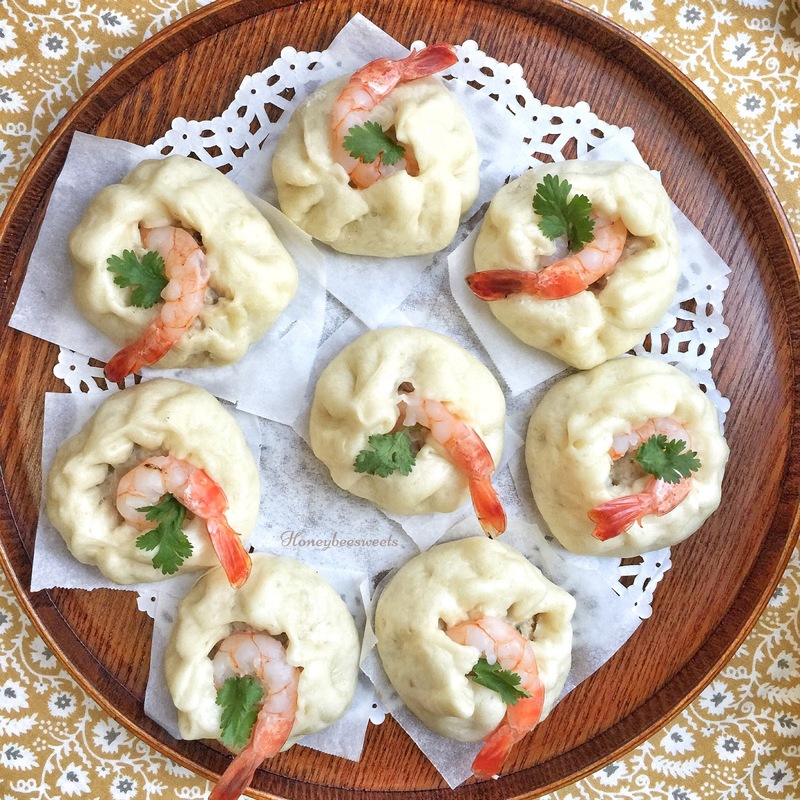 Let the baos proof at room temperature for 210-15 minutes before steaming. In the meantime, prepare the steamer at low fire. My steamer can contain up to 8 bags at a go. Remember to use a kitchen towel to wrap the steamer cover so as to steamed water from dripping on the bao. Steam the baos at medium low fire for 10-12 minutes. There after, off the fire and leave the baos inside the steamer with the cover still on for another 10 minutes. Then slowly open the cover halfway and let the cool air slowly flow in. 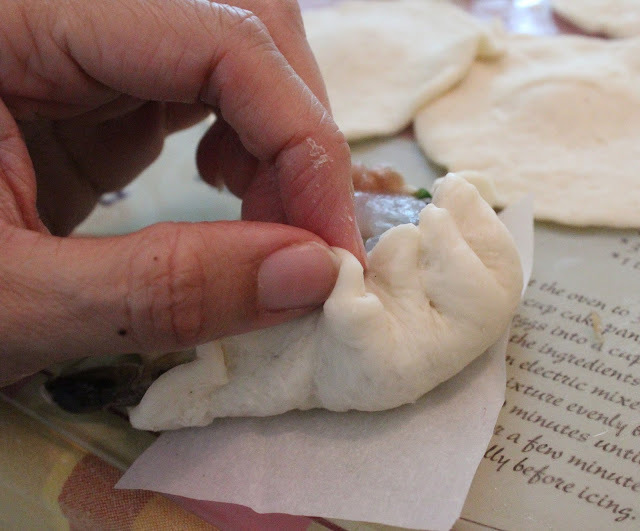 This slow and "tedious" steps is to prevent the bao from deflating. Ever happened to me a few times and I swore never again I will rush open the steamer cover again. :P Yup, learning through the hard ways. 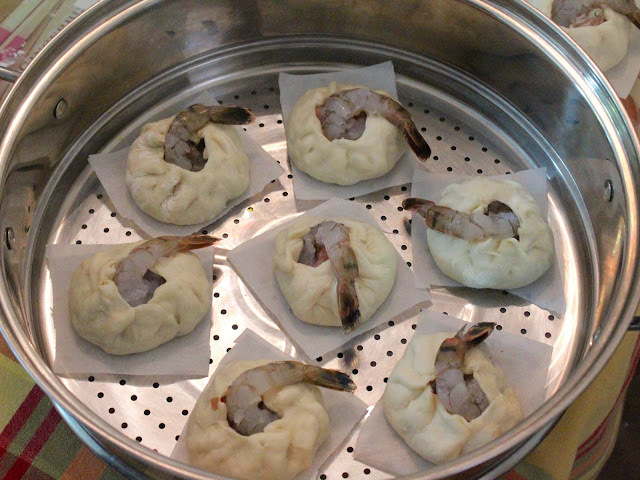 A close up to see how nice and fresh those Nobashi prawns look in this steamed baos. It tasted fresh too! You can be sure it doesn't taste rubbery but a slight crunch and sweetness, yum! All these are already pre-cooked, all I need to do prior to serving them is just grill them in the oven 180C for 15 minutes or a quick pan sear on the stove. So easy and convenient to whip these up, especially on busy days when I am tight down by the hundred and one things I need to complete, these are lifesavers! And my kids love food on stick! 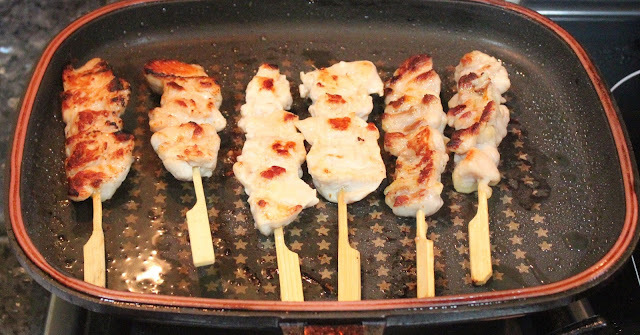 Seriously, yakitori, satay or popsicles, you name it! So having these are actually a treat for them. A mandatory close up shot here. :D Some steamy sushi rice will do. If you follow me on Instagram, you will know that I usually have a salad dish on the side when I serve up some main course. This time I did something really simple. 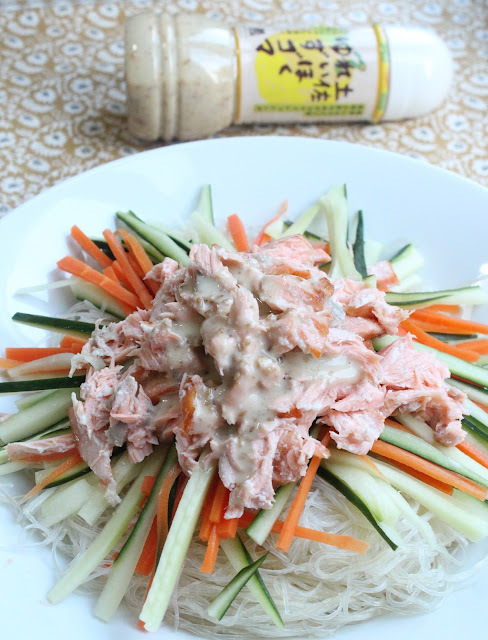 Flaked salmon and julienned vegetables over cold noodles. I marinated the cold noodles with light soy sauce and mirin and then drizzle the whole salad with this Yuzu Sesame Dressing which I too bought it at Rakuten.com.sg. All these are just some of the simple ideas that you can try out using the items from the online shop Rakuten.com.sg. Do feel free to browse through the other items they offer online. And their ongoing great sales that you shouldn't miss! And hopefully I will be able to share more yummy recipes to you guys using their fresh ingredients soon! I am currently eyeing on that Japan Mentaiko Tube 500G 福岡産 明太子 haha! In a stand mixer bowl, add in all the ingredients except the butter. Knead it well using the hook attachment, the dough will slowly come together. Continue to knead and eventually it will pulls away from the side of the bowl. That will take about 10-12 minutes. You can stop the kneading for 2 to 3 minutes to have a break in between. When it is well proofed, poke in the center. If it doesn't rise back up, the dough is ready to be shaped. Punch out the air and weigh out 9 portions of ~62 g of dough. Should be just about enough. Roll round and cover to rest for 5 minutes before shaping. Preheat the oven to 170C and grease a 8" by 8" baking tray. No parchment paper is needed. 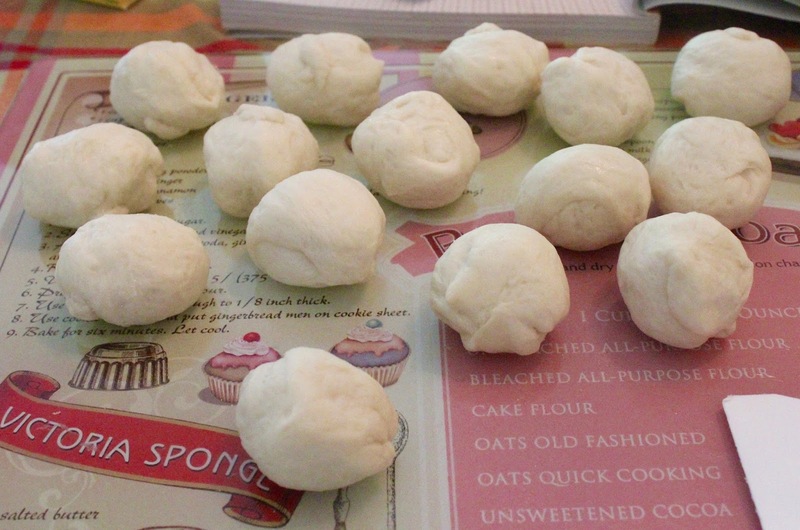 Roll the dough round and seal in any loose bits. Then dip the top of the dough on to the sesame seeds. Then place the dough, sesame seed side up into the prepared baking tray. Repeat till all the dough is used. Let it proof for another 30 to 40 minutes or till it rises to the top. Bake in the oven for 28 minutes till golden brown. If top turns brown too quickly, cover with aluminium foil. Once baked, remove from oven and also from the baking tray immediately. Cool on the rack. So happy with the result! 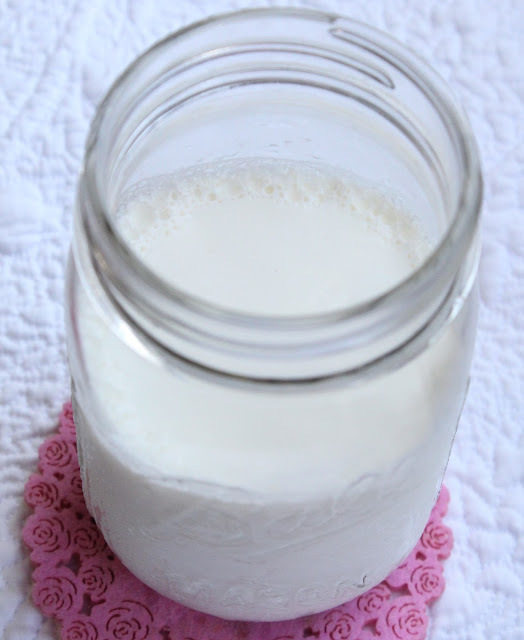 Soft and fluffy and good for sweet or savoury accompaniment in your meals. I had it for my lunch with pulled pork and made an awesome burger! If you follow me on Instagram, you would have probably saw these photos. :P If not come join me at @Honeybeesweets.sg. 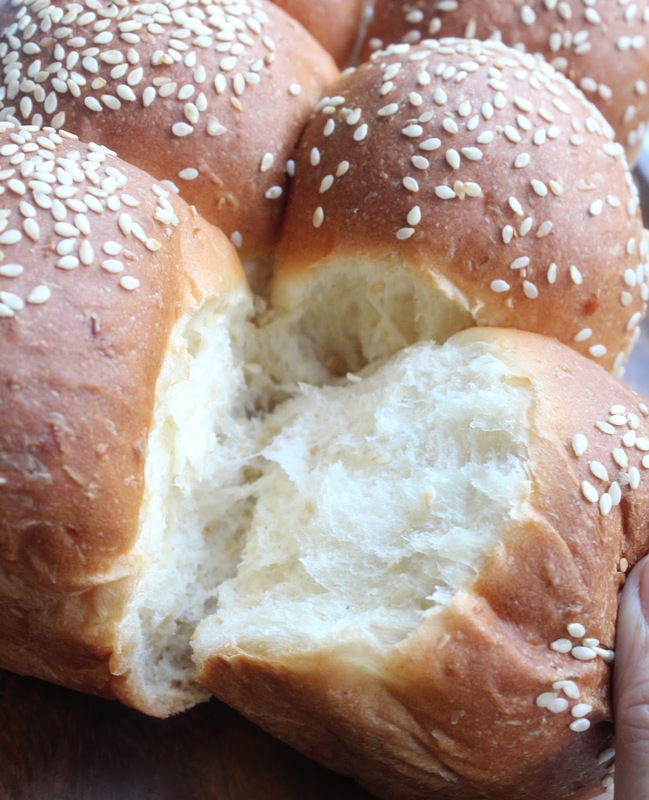 You can also catch a video I posted there on how I tear up the soft buns. :P It's all good...just to test the texture haha! 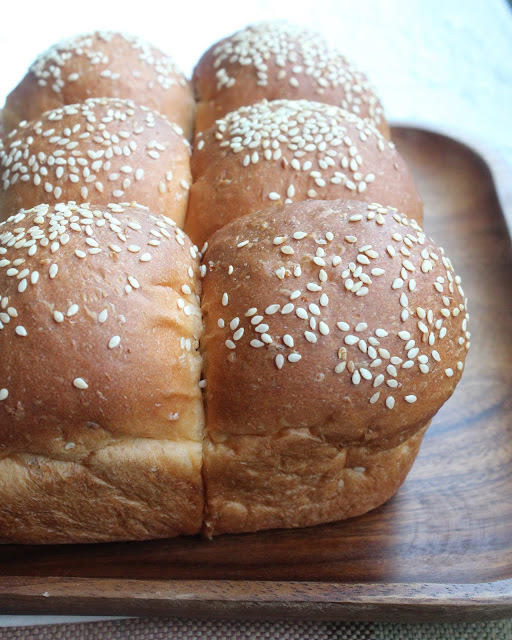 This bread took me 3 hours top from beginning to end to bake up. So plan your baking time properly and you can get it on the dinner table sooner then you expected! Hope you all will give this a try and let me know or show me when you do! Happy baking and remember to keep doing what you LOVE! I find that it is rather hard to buy healthy bakes outside. In fact it is rather uncommon to see any store selling. Whether it is gluten free or no butter or non dairy bakes. Yeah...we are pretty much on our own when we want to have healthier bake goodies. And ever since I come across coconut oil, I have fallen in love with it! Considering it contains quite a number of health benefits, makes it all the more desirable. Never used it before? Well, you better go grab a bottle then. 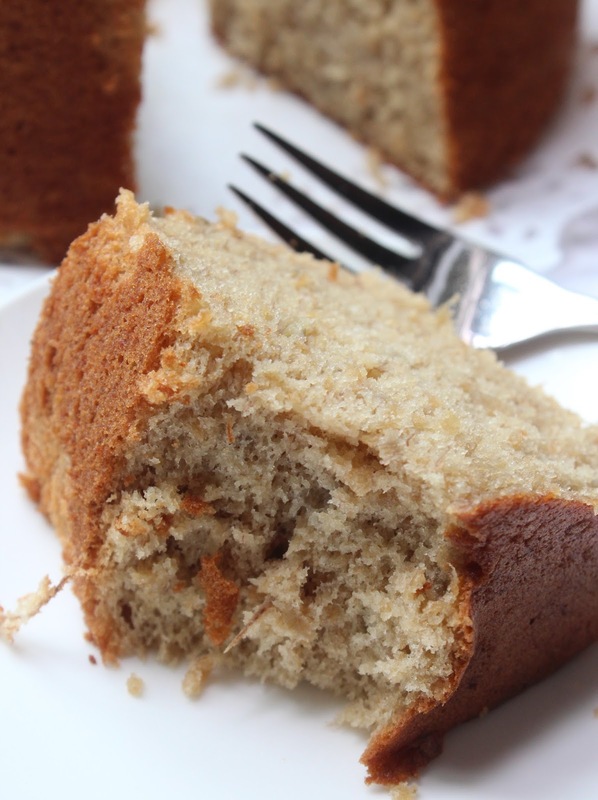 ;) In this recipe of mine, coconut oil is pretty much the key ingredient for making this cake so good...well the banana too of course. 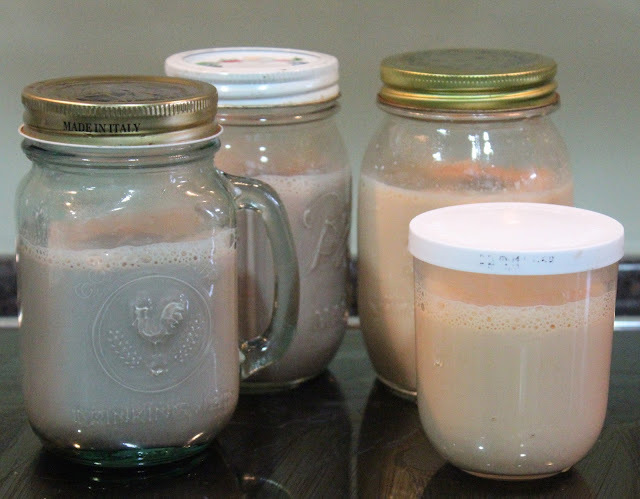 Will share more with you later where you can buy this "elixir" so you can add them in your daily diet or bakes! Now the cake...Wholewheat Banana Coconut Chiffon. There is only 15 g of corn flour, no butter, less sugar and contains no coconut milk or dairy products. Sounds too healthy to taste good? Oh ho ho...you are wrong, this is so good, I cannot stop at one slice! Really! Looks rather unassuming I know. But I have to admit, this is indeed a simple cake, nothing complicated. But simplicity has its beauty too! 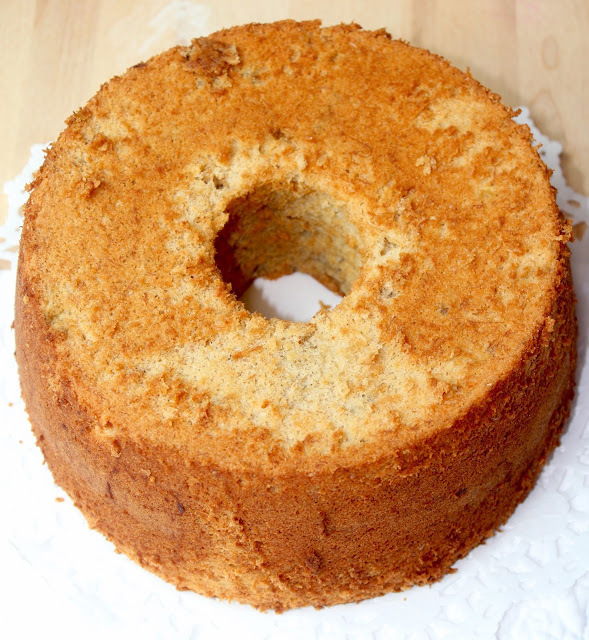 By using the chiffon cake method, the cake is much lighter and thus using coarser flour like wholewheat flour won't be a "problem". 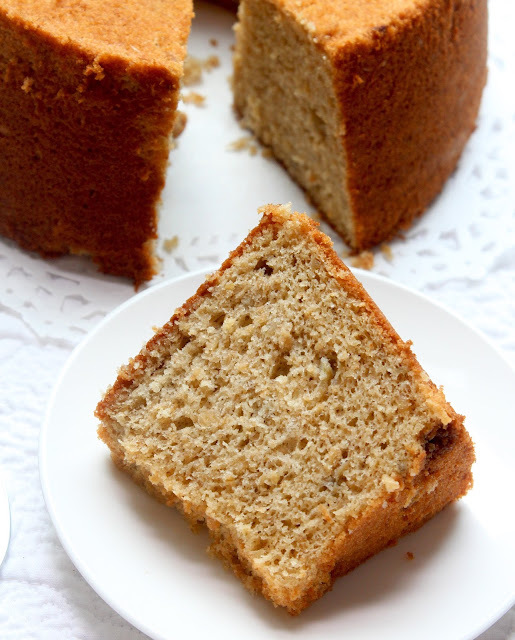 In fact I am loving that extra texture the wholewheat flour gives the cake, little bits to chew on. ;9 I shall give oat flour a try next time! 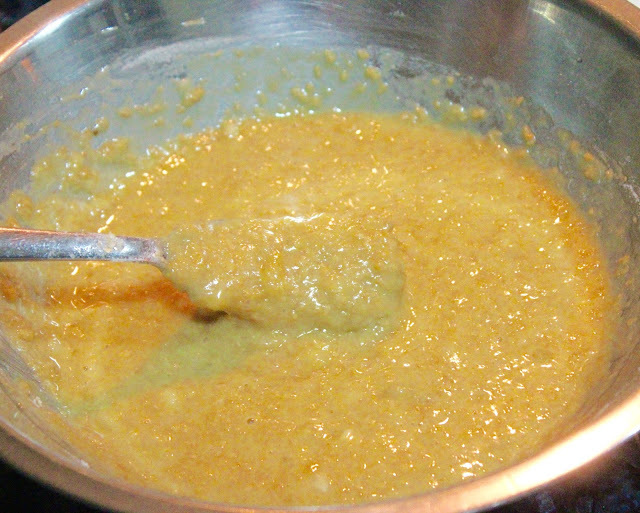 In a mixer bowl, add egg yolks and light brown sugar. 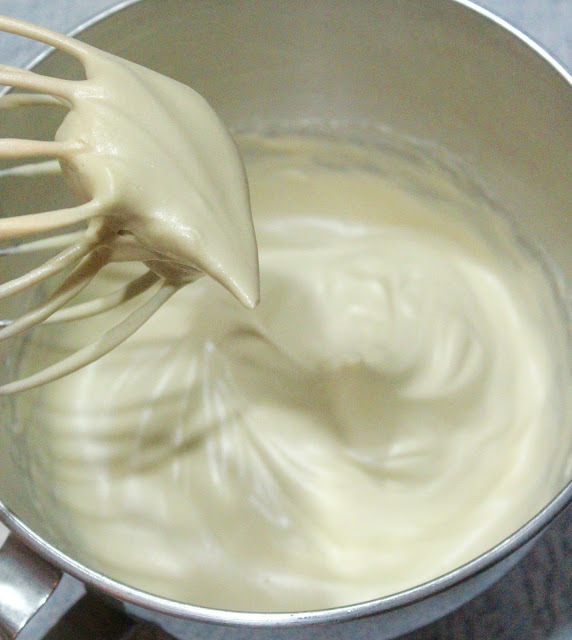 Whisk till the sugar has melted and the mixture is slightly thicken and more pale in colour then before. Next add in the mashed banana, vanilla extract and coconut oil. Whisk well to combine again. 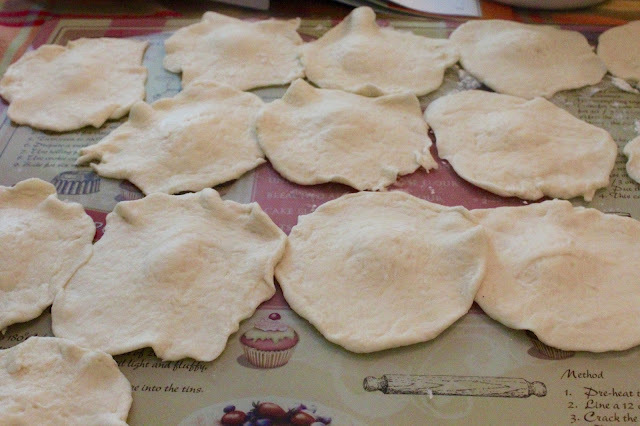 Fold in the wholewheat flour, salt and baking powder. Fold in till all is incorporated and no visible lumps of flour. In another mixing bowl, add in the egg whites and sugar. Beat the mixture till stiff peaks. Gently fold in the egg white batter to the egg yolk batter in 3 separate portions. Do not over mix. Pour the batter into the prepared tube pan and run a toothpick through the batter to remove any air pockets trapped inside. Then bake it in the preheated oven. Bake for 28-30 minutes till golden brown and cake tester comes out clean. Once baked, remove from oven and invert the pan to let cool. Once it is cool, you can carefully unmould the cake and serve. Well at least this time the whole cake was still intact! And and and...it tastes great! 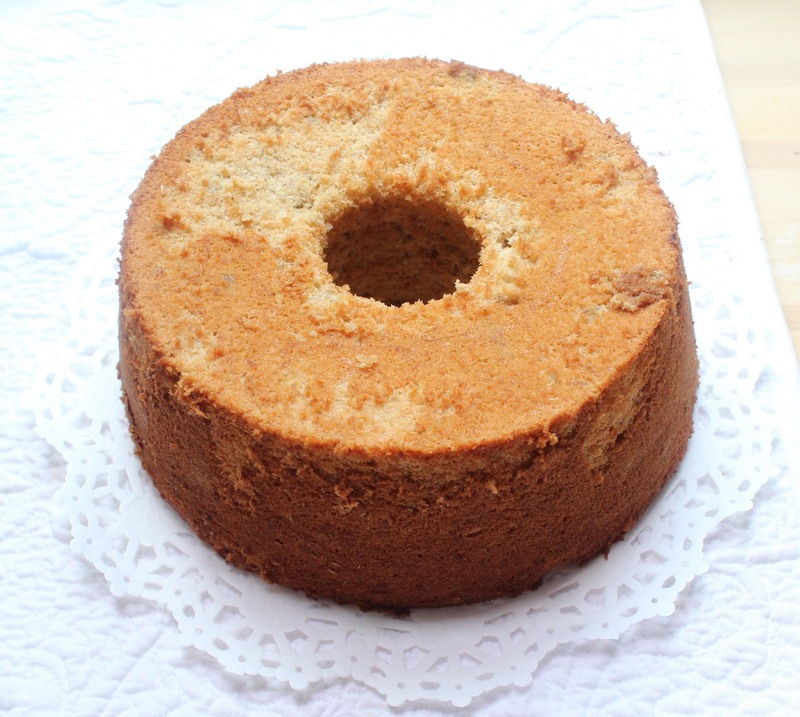 :9 Soft, aromatic with coconut scent and the wholewheat flour did not weigh it down but giving it that extra nice bite to the texture, I like! Amazing that no dairy product was used, no butter nor milk! So lactose intolerant people can safely try this recipe out, woohoo! 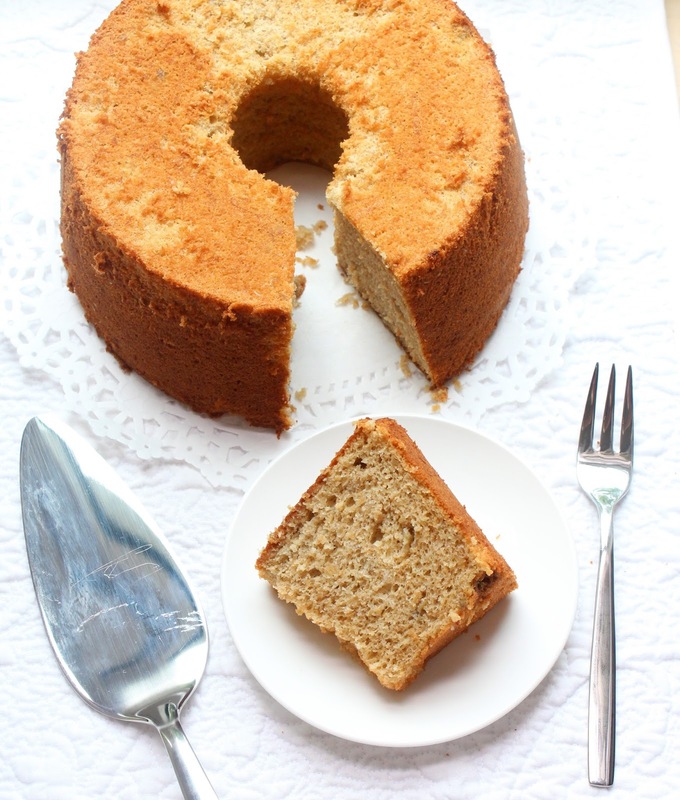 Suitable for elders and kids alike, a healthier cake they can enjoy any day! See, I didn't lie, that is the soft fluffy texture of the cake you see. And with a cup of hot tea, you are all set for an awesome breakfast or tea break! 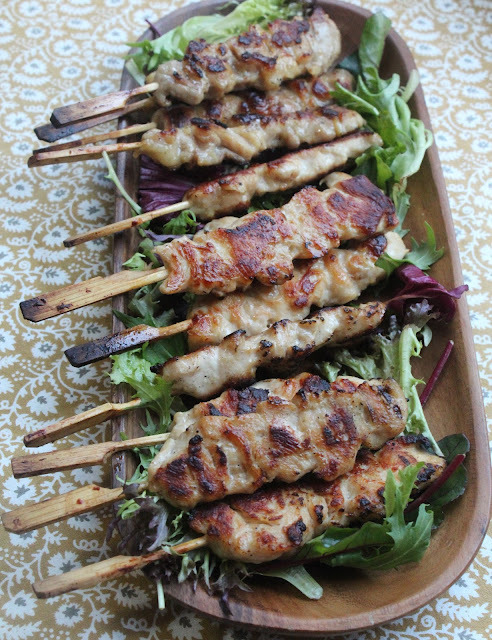 Hope you all will like this recipe too! Happy Baking all!